The 2017 edition focuses on privatization, partnerships, corporate capture and the impact they have on sustainability and inequality. The articles and textboxes cover all sectors of the 2030 Agenda and the SDGs. According to the report, it is time to counter privatization trends, reclaim public policy space and take bold measures to strengthen public finance, regulate or reject PPPs, and weaken the grip of corporate power on people’s lives. These are indispensable prerequisites to achieve the SDGs and to turn the vision of the transformation of our world, as proclaimed in the title of the 2030 Agenda, into reality. 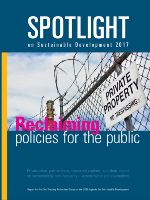 A global coalition of civil society organizations and trade unions present the Spotlight on Sustainable Development 2017 report. The report provides a comprehensive independent assessment of the implementation of the 2030 Agenda and its Sustainable Development Goals (SDGs). At the roundtable event authors of the Spotlight Report will present key findings and recommendations to participants for discussion. Speakers include: Barbara Adams/Jens Martens (Global Policy Forum), Roberto Bissio (Social Watch), Ziad Abdel Samad (Arab NGO Network for Development), Corina Rodríguez Enríquez (DAWN), Chee Yoke Ling (Third World Network), Kate Donald (CESR), Stefano Prato (SID), Sandra Vermuyten (PSI).